Blog Ardgillan Castle Launch Success! We had a wonderful launch for our collection, Paws for Story Time, in Ardigllan Castle on Saturday. Thank you so much to everyone who turned up and bought a book. It was a packed event! Thanks also to Ardgillan Castle for giving us their beautiful venue free of charge. Huge thanks to Sharon Rudden who organised the event and her husband, Kevin, who provided excellent graphics and movies so that we could watch a film about Crumlin and our own special movie (made by Kevin Rudden) for the Late Late Toy Show (begging Ryan Tubridy to put our book on the show!). Clyde Davidson, from Skerries, lent us his sound equipment. We had drinks and goodies from C&T’s in Skerries and Tescos in Rush. While V.I.P ( Very Important Parites) in Skerries, and Alladins Cave in Rush provided balloons to add to the festivities. Emily Diebold from the Skerries News was there taking pictures, as was Fintan from the Fingal Independent. We sold 279 books at the launch but we have 721 more to sell! Paws for Story Time is now for sale through my website www.meganwynne.com/shop and many local outlets in Skerries, Malahide and Donabate. Each book costs €10. Please buy one if you can as all profits are going to Crumlin Children’s Hospital. 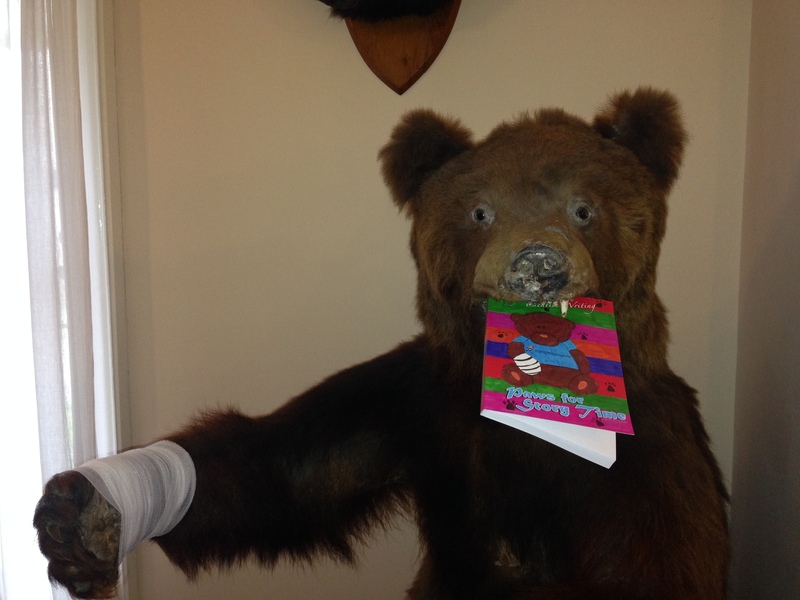 Here is a photo of a very popular bear who was our mascot for the day.